iland continuously enhances access, analytics and reporting on cloud and DRaaS workloads. 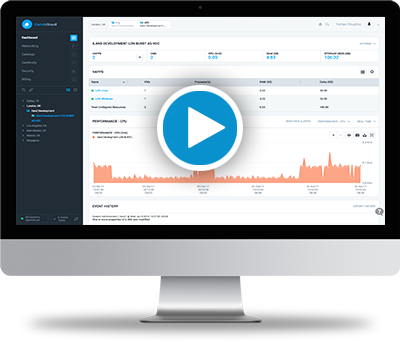 Through our console, you have the tools you need to manage your cloud and communicate your success. The iland Secure Cloud ConsoleSM was designed from the ground up to enable organizations to see and control their cloud resources and costs right down to a granular level. But then we went a step further. We wanted customers to predict what their likely usage and costs would be for the remainder of the month; predict costs over longer time periods; and send reports to any interested party that needs them. When it comes to your systems and data, knowledge is power. Graphs of performance are overlaid with event information – from VM deployment to resource changes – ensuring you can rapidly assess and adjust your environment. Enable your team to generate, download, and share the information that matters most to you: your data. Whether it’s performance data, usage reports, or billing statements or a complete VM inventory report, the iland Secure Cloud Console allows you quick and customizable generation of records to help your team make better informed decisions with less effort and time. Your cloud needs to operate efficiently in order to achieve cost savings and do so without adversely affecting reliability, flexibility, speed and control. Do you know how much CPU, RAM and Storage your applications or individual VMs are actually consuming in your cloud? The ability to see how your cloud resources are performing from an organization level down to an individual VM is key to cloud optimization. 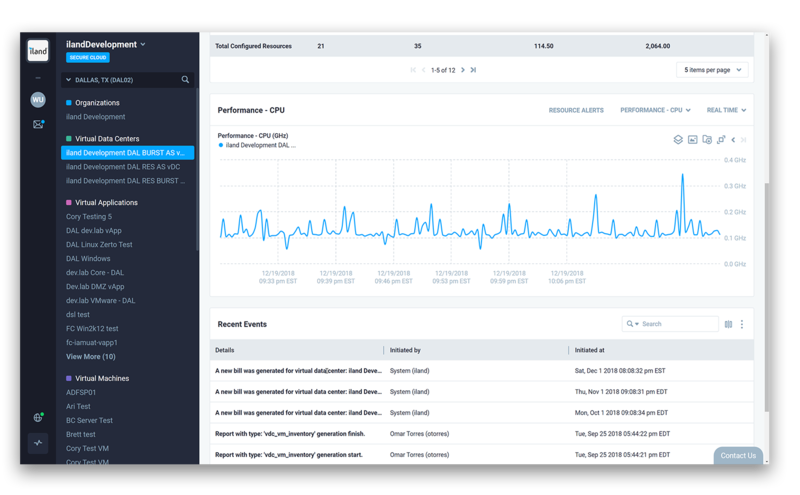 You also need detailed performance history of each VM or vApp in real time and historically for the last week, month or year in order to best determine trends. 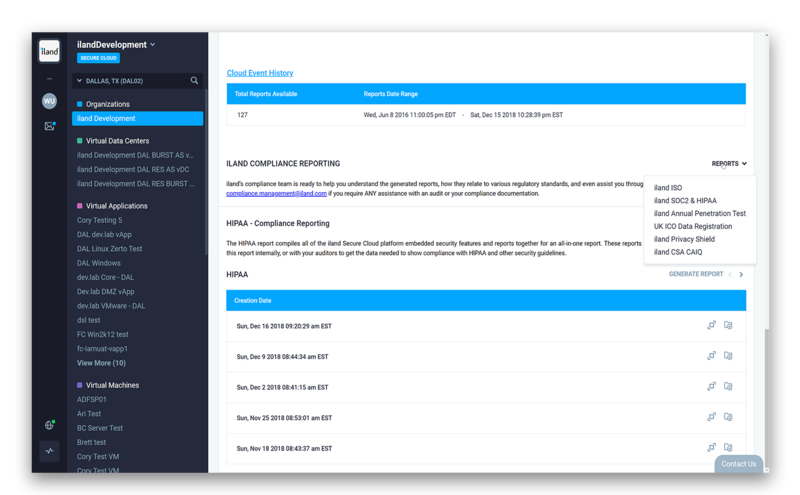 The iland Secure Cloud Console gives you the ability to report on performance data at a very granular level for a variety of management audiences. Alerts play an important part in the control and management of your iland cloud. 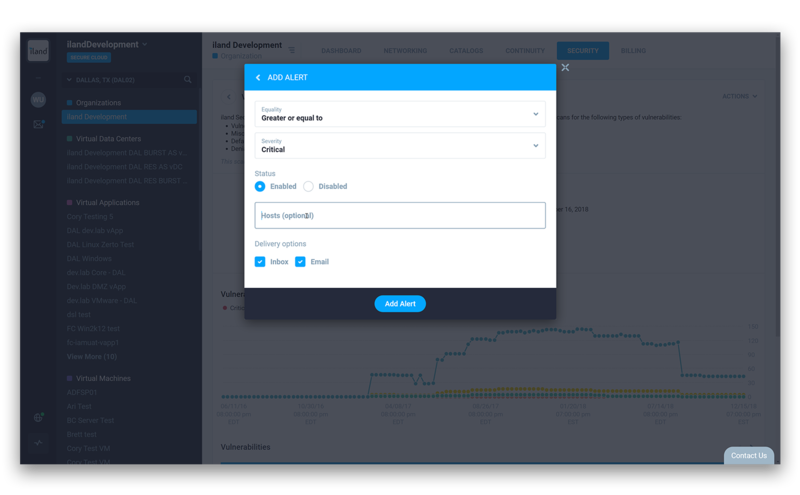 Unlike many clouds, you can set alerts at different levels – from the organization level down to an individual VM – that notify you when pre-configured consumption thresholds have been met and/or exceeded by specific resources. Alerting is also integrated into our advanced security option, ensuring that those notifications get attention as soon as possible. Users can set up customized alerts on security settings and receive notifications on security events. The iland Secure Cloud Console configures reports that give you the billing information you need in real-time, historically and for forecasting purposes. You can determine which applications and VMs make up the majority of your spending, and even split your bill by cost-center or business unit. You can then take action by reallocating resources, increasing reservations and even shutting down unneeded systems. And, with the power to forecast spending on your pay-as-you-go resources, cloud billing need not be an unexpected surprise.